Interested in the real story behind the creation of the Federal Reserve System, I was able to examine source notes of G. Edward Griffin’s Book “Creature from Jekyll Island” and a few others. I am able to provide digital copies of enough source material to confirm the essential details of the secret meeting and allow my readers to see it for themselves in the words of those who actually attended this meeting. One such participant was Frank A. Vanderlip, President of National City Bank in New York. He provides the details in his autobiographical account “From Farm Boy To Financier” in chapter 21: A Conclave on Jekyl Island. There was an occasion, near the close of 1910, when I was as secretive, indeed, as furtive as any conspirator… I do not feel it is any exaggeration to speak of our secret expedition to Jekyl Island as the occasion of the actual conception of what eventually became the Federal Reserve System. Mr. Stillman in Paris … had just had a long conference with Senator Nelson Aldrich (Zivil in our code) who was very keen to get to work on banking and currency revision. Mr. Stillman said he had told Mr. Aldrich that freedom from interruptions was essential, but that it could be accomplished by getting Davison and me down to his estate in Rhode Island without any one’s knowing of it. Mr. Stillman expressed to me his fear that after revision the banks might not be so well off … from that time on Davison and I ought to follow the matter very closely, and keep in touch with Aldrich. Senator Aldrich was the father-in-law of John D. Rockefeller, Jr., and himself a very rich man. Now then, fancy what sort of head-lines might have appeared over a story that Aldrich was conferring about new money legislation with a Morgan partner and the president of the biggest bank. On October 28, 1910, I wrote to Mr. Stillman in Paris: “Senator Aldrich met with what came very near being a severe, if not fatal automobile accident … the accident has naturally postponed the conference. Those who had been asked to go were Henry Davison, Paul Warburg, Ben Strong, and myself. From Washington came A. Piatt Andrew, who was then an Assistant Secretary of the Treasury, and who now is a member of Congress from Massachusetts. We were told to leave our last names behind us. We were told, further, that we should avoid dining together on the night of our departure. We were instructed to come one at a time and as unobtrusively as possible to the railroad terminal on the New Jersey littoral of the Hudson, where Senator Aldrich’s private car would be in readiness, attached to the rear end of a train for the South. We addressed each other as “Ben,” “Paul,” “Nelson,” “Abe” (it is Abram Piatt Andrew). Davison and I adopted even deeper disguises, abandoning our own first names. On the theory that we were always right, he became Wilbur and I became Orville, after those two aviation pioneers, the Wright brothers. Incidentally, for years afterward Davison and I continued the practice, in communications, and when we were together. … it was the names of all printed together that would have made our mysterious journey significant in Washington, in Wall Street, even in London. Discovery, we knew, simply must not happen, or else all our time and effort would be wasted. If it were to be exposed publicly that our particular group had gotten together and written a banking bill, that bill would have no chance whatever of passage by Congress. “What we ought to do· first,” I said, “is to set down those things about which we are agreed; then, one by one, we can take up those things about which we seem to disagree.” … of course we knew that what we simply had to have was a more elastic currency through a bank that would hold the reserves of all banks. We were taken by boat from the mainland to Jekyl Island and for a week or ten days were completely secluded, without any contact by telephone or telegraph with the outside. We had disappeared from the world onto a deserted island. Thanksgiving occurred during that week and we ate wild turkey with oyster stuffing and went right back to work. I enjoyed that period as I never have enjoyed anything else. I lived during those days on Jekyl Island at the highest pitch of intellectual awareness that I have ever experienced. It was entirely thrilling. too fast and lower in another that was lagging? Should it restrict its services to banks? What open-market operations should be engaged in? We returned to the North as secretly as we had gone South. It became known to the country as the Aldrich Plan. Too ill to write an appropriate document to accompany his plan, Ben Strong and I went on to Washington and together we prepared that report. If what we had done then had been made known publicly, the effort would have been denounced as a piece of Wall Street chicanery… As is now well known, the bill we drafted did not get through Congress. Senator Aldrich issued a confidential invitation to Henry P. Davison of JP Morgan & Co.; Frank A Vandeilip, president of the National City Bank and an ex-Assistant Secretary of the Treasury; Paul M. Warburg, then of Kuhn, Loeb & Company, and A. Piatt Andrew, Assistant Secretary of the Treasury, to accompany him on an extremely important – and secret – trip. Mr. Davison had gone with the Commission to Europe as an adviser, Mr Vanderlip was a recognized authority on banking and currency fundamentals, Mr. Warburg had written most learnedly on the subject, and Mr. Andrew had done a great deal of work for the Commission. After a journey hedged with the utmost secrecy, the party were landed in a small boat at the deserted Jekyl Island, off Georgia. “The servants must under no circumstances learn who we are,” cautioned Senator Aldrich. “What can we do to fool them?” asked another member of the group. The problem was discussed. “I have it” cried one. “Let’s all call each other by our first names. Don’t ever let us mention our last names.” It was so agreed. Nelson had told Harry, Frank, Paul, and Piatt that he was to keep them on Jekyl Island, cut off from the rest of the world, until they had evolved and compiled a scientific currency system for the United States, a system that would embody all that was best in Europe, Every member of the group voted for a central bank as being the ideal corner-stone for any national banking system. The actual dictating of the measure was done largely by Frank and occasionally by Paul. Later Benjamin Strong, Jr , was called into frequent consultation and he joined the “First-Name Club” as “Ben” I want to add explicitly that this information did not come from Mr Warburg; indeed, he and other members of the group will be very much astonished when they read this. Mr. Warburg was a Central Bank advocate, yet as early as 1910, realizing the political difficulties, he evolved a plan for “A United Reserve Bank of the United States,” the underlying principles of which are embodied in the law now in force. The centralization of reserves under properly balanced authority and the rediscounting of an improved type of commercial paper so as to transform immobile promissory notes into bills of exchange, were the two cardinal reforms he constantly emphasized – reforms which were written into the Owen-Glass law. The depth of his sincerity and of his zeal for currency reform can be partly gauged by the fact that he gave up an income of at least $500,000 a year to accept a salary of $12,000 a year as a member of the Federal Reserve Board. For centuries Warburgs have figured prominently in German commerce, particularly in Hamburg. Their entrance into the banking field dates from the time George Washington was President of the United States. Mr Warburg’s great-grandfather then founded the banking house of Warburg & Warburg in Hamburg, and Warburgs have conducted it ever since, no outsiders being eligible for membership. None was ever needed, for the Warburg fathers saw to it that the Warburg sons were trained to maintain and expand the business. Paul Warburg married Nina J. Loeb, daughter of the late Solomon Loeb, of Kuhn, Loeb & Co. While Mr Forbes makes it clear that his information was not obtained by Mr. Warburg, Nathaniel Wright Stephenson offers an account attributed to Mr. Warburg in his 1930 tome, entitled: Nelson W. Aldrich A Leader in American Politics. I was unable to obtain a full copy of the book and very much desire to see the remainder of his account. I provide what is available, I hope someone will contact me with the remaining pages of the account. In the autumn of 1910, six men went out to shoot ducks. That is to say, they told the world that this was their purpose. Mr. Warburg who was of the number, gives an amusing account of his feelings when he boarded a private car in Jersey City, bringing with him all the accoutrements of a duck shooter. The joke was in the fact that he had never shot a duck in his life and had no intention of shooting any. His five companions, whatever their past might have been, were as far as he from a sporting purpose in this journey. The duck-shoot was a blind. Mr. Aldrich and representatives of three extremely significant New York banks were taking this elaborate mode of getting away by themselves without putting anybody on their track. It was Mr. Davison who had devised the plan. Their objective was a hunt club on Jekyl Island off the coast of Georgia. Why all this mystery? Finally, Mr. Warburg admits the meeting in his work “The Federal Reserve System: It’s Origin and Growth 1930 volume 1. In chapter 4: The Aldrich Plan (1910-1912) he discusses the the secret meeting of November 1910. He gives no details of the location or participants but he does confirm the account by Nathaniel Wright Stephenson in his footnotes. These volumes are too large to supply here, however, an astute search will find them. I have pdf copies of both volumes. I will add links to the copies hosted by the St. Louis branch of the Federal Reserve at the end. In November, 1910, I was invited to join a small group of men who, at Senator Aldrich’s request, were to take part in a several days’ conference with him, to discuss the form that the new banking bill should take. During this conference I had my first opportunity of studying the Senator carefully…I was impressed by the fact that, although he was a very shrewd politician, he showed a surprising disregard for party politics in dealing with our particular problem. We were, after all, discussing a proposal which involved a revolutionary break with old Republican banking traditions; but not once in all the deliberations was that phase of it mentioned. On the contrary, he always stressed the imperative necessity of dealing with the question on a non-partisan basis. When I joined the conference, I was quite at sea as to what its outcome would be and frankly skeptical as to its prospects of success. During the first days’ sessions, Senator Aldrich was much inclined to discuss the possibilities of a full-fledged central bank on the European order—a model he seemed loath to abandon. But when the conference closed, after a week of earnest deliberation, the rough draft of what later became the Aldrich Bill had been agreed upon, and a plan had been outlined which provided for a “National Reserve Association,” meaning a central reserve organization with an elastic note issue based on gold and commercial paper. This was not a central bank in the European sense. It was strictly a bankers’ bank with branches under the control of separate directorates having supervision over the rediscount operations with member banks. Moreover, the Senator had not yet agreed to a provision, which seemed to me of fundamental importance, that of giving the notes of the National Reserve Association the status of lawful reserve money when in the tills of member banks. The bill frankly followed the Republican doctrine of “keeping the government out of business;” but, as a starter, it was encouraging beyond all expectation. Indeed, the highest hopes seemed warranted that a most satisfactory piece of legislation could eventually be developed from it. footnote 2: Though eighteen years have since gone by, I do not feel free to give a description of this most interesting conference concerning which Senator Aldrich pledged all participants to secrecy. I understand, however, a history of Senator Aldrich’s life by Professor Nathaniel Wright Stephenson is shortly to be published, and that this book will contain an authorized account of this episode. I can only assume, since Nelson Aldrich had sworn the participants to secrecy and that Stephenson’s book dealt primarily with Mr. Aldrich, that the authorized account was that of Mr. Nelson Aldrich, himself. Who else other than Aldrich could have authorized its telling? Why it took 15 years after his dealth to surface, however, is a bit of a mystery to me. Hopefully I will obtain the rest of this source and more light will be shed on the question. Mr. Warburg’s book was released in 1930, but clearly by the footnote we can tell that those lines were written in 1928. Frank A. Vanderlip did not issue his account until 1935 after the “cat was out of the bag” so to speak. In 1931, the New York Times published a piece eulogizing George F. Baker, a Morgan asset, in which the Jekyl Island Club was referred. Also, B. C. Forbes published an earlier account of the episode in Leslie’s Weekly in 1916. I was unable to dig it up, however, I found a report of the account in Current Opinion for December 1916. This account would have been the earliest report yet known, but was considered speculative at that time. Subsequent accounts from the members themselves validates the story. I think it is now very important to publish this talk on my blog. Gold and Silver are breaking out as I type. The dollar index is down and stocks are down. The so-called “recovery” looks to be just about over. The Federal Reserve has hinted at QE III (Quantitive Easing Round 3) and so the dollar is now in jeopardy. Quantitive Easing is just a fancy economist’s term for printing money. Just like every other commodity, when the supply of dollars increases, its value drops. You are going to see more inflation. Prices rise when the value of the dollar drops. The most important thing to understand, however, is that this is all by design. Americans need to understand this, because the SOB’s that are doing this are going to offer a solution. That solution will probably be a new dollar backed by some international currency that may or may not have a precious metal or basket of commodities backing it. Why an international currency? The world’s huge banking interests know that economic union is a precursor to political union. This is the same road map used in Europe. The common market in Europe preceded political union by 50 years and was built in the wake of the devastating destruction of WWII. They don’t intend to wait another 50 years. History tells us that these types of economic down-turns often lead to war. We already have war, but the threat of an escalation is real. No one knows the future but the road signs ahead are troubling. 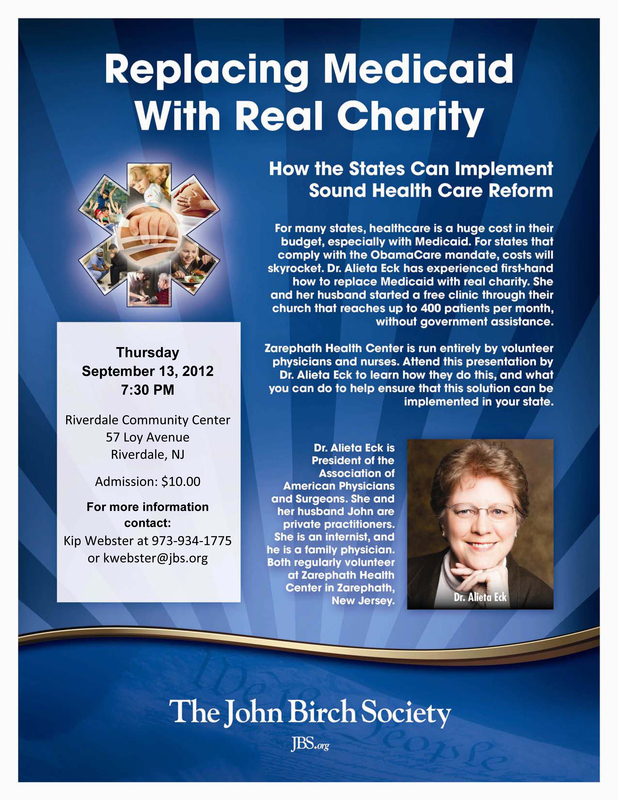 Come hear Dr. Alieta Eck talk about replacing Medicaid with genuine charity. She and her husband operate a free clinic through their church that reaches some 400 or so patients a month. They take no government assistance. It will become increasingly more important for neighbors to take up genuine charity as the financial condition of our communities, states and federal government continue to head south. Many thanks to WhatReallyHappened.com for picking up my youtube video “From Major Jordan’s Diary” which is really an audio file with a few splash pages. Their post is here. And thanks also to Charleston Voice (Bill Rummel) for linking in as well. I loaded this audio because I consider it to be a first-hand historical account of a World War II event that is skimmed over in favor of the alluring accounts of true American Patriotic heroism on the battle field. Don’t get me wrong, I love those gripping tales and I highly recommend the “Band of Brothers Series” for those of you who also enjoy them. Since this video was added to their news collating service I have had a steady uptick in hits on this video and thought it prudent to provide a link to the pdf and html formats of Major Jordan’s Diary. The pdf is provided by articbeacon.com and I link to it below. The html appears to be an extract from Nexus Magazine. For those of you who have heard the speech delivered by Major Jordan on my youtube channel and have followed this link for more information, see the reference links below. to The Reality Zone for Capturing this Lecture so long ago. to The John Birch Society Chapters in California for hosting this speaking engagement in 1963.
to G. Edward Griffin for his concise and professional narration and introductory comments. to WhatReallyHappened.com for publicizing this important youtube video/audio track. to Bill Rummel whom I suspect had a great deal to do with advancing this story. to Western Islands (A JBS Publishing Company) for Publishing the Diary after it went out of print the first time. Thanks fromthetrenchesworldreport who also pickedup this youtube video on their site in December 2014.